On March 19 at approximately 10 a.m., a teacher at La Plata High School noticed a student who appeared to be under the influence of drugs. The teacher called school administration to the classroom and an administrator immediately responded and removed the student. Administrators subsequently discovered the student was in possession of a container of marijuana-infused brownies. They also found a loaded gun in his book bag. 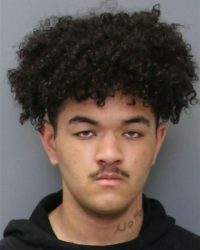 The School Resource Officer recovered the gun and drugs and arrested the student, Kristopher Alexander Raul McDonald, 16, of La Plata. McDonald was charged as an adult with possession of a weapon on school property, possession of drugs with intent to distribute while armed, loaded handgun on person, carrying a concealed dangerous weapon and other related charges. Cpl. K. Burger is continuing the investigation to determine where the student got the gun and why he brought it to school. At this point in the investigation, there is no indication McDonald planned to use the weapon against anyone. Anyone with additional information is asked to contact Cpl. K. Burger at (301) 932-2222. The Charles County Sheriff’s Office is a full-service law enforcement agency comprised of more than 600 police, corrections and civilian personnel responsible for protecting more than 150,000 residents. The CCSO was accredited by the Commission on the Accreditation of Law Enforcement Agencies (CALEA) in 2001 has been designated as a CALEA Gold Standard of Excellence agency since 2011. Established in 1658, the CCSO is one of the oldest law enforcement agencies in the United States. For more information, visit www.ccso.us. Charles County Crime Solvers offers rewards of up to $1,000 for information that leads to the arrest or indictment of a person responsible for a crime in Charles County. All individuals who provide tips through Crime Solvers will remain anonymous. Anyone with information about an unsolved crime or the location of a fugitive may contact Charles County Crime Solvers by calling 1-866-411-TIPS. Tips can also be submitted online at www.charlescountycrimesolvers.com or by using the P3Intel mobile app, which can be found in the Android Store and Apple store by searching P3tips. For more information about the P3 program, click on this link: www.p3intel.com. Where does a 16 yo go to get a neck tat? If obama had a son. Wouldn't it be great if Cpl Burger's first name was King?